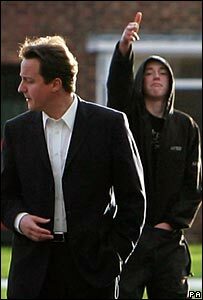 A teenager pictured firing an imaginary gun behind Tory leader David Cameron has been sentenced to 18 months in a young offenders' institution. Ryan Florence, 17, was sentenced at Manchester Youth Court after admitting three counts of burglary and one of motor vehicle interference. He was also given a three-year criminal Anti-Social Behaviour Order (Asbo). District judge Diana Baker said she was lifting reporting restrictions on his identity as a deterrent to others. She said: "This is a young man who has himself talked to the press freely. "He has placed himself in a position where he has openly boasted of his criminal activity. "I think there's no more powerful deterrent than being named and the public knowing what sentence the defendant has been subjected to and for him to know it's a disgrace." After he was photographed making a shooting sign at the Tory leader last month in Wythenshawe, Florence bragged about his drug taking and gang culture. The court heard he had a number of previous convictions for burglary and was under supervision on a Community Rehabilitation Order when he committed a further break-in. One of the houses he burgled was just a few doors away from his own home in Wythenshawe, Manchester. Ms Baker, sentencing, said: "When I take into account that the third burglary was committed whilst you were on a supervision and intensive surveillance order for burglary, and that you have previous convictions for burglary and other serious matters, detention is the only appropriate sentence." Ms Baker told Florence he was "very likely" to go to jail if he breached the terms of his Asbo after completing his detention. The conditions of the Asbo ban him from associating with seven other youths and entering certain parts of his estate in Benchill.